Thinking about doing a mountain biking event on the East coast of USA? Get in touch with Manny Lugo and he'll do a great video for you. 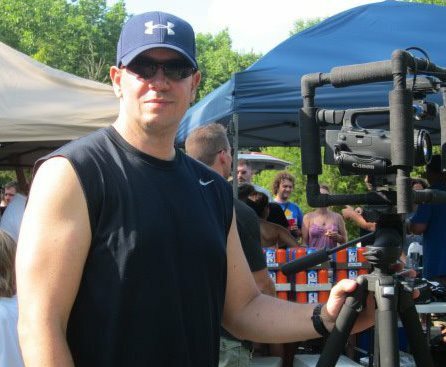 Manny is a passionate mountain biker and videographer who runs VideoTrailReviews.com - East Coast Bike Trail Reviews. 1. As usual, I need to ask you what's the editing software you use and why? I first started editing with Magix Movie Edit Pro but I switched to the Adobe CS Suite a little over a year ago. The integration between Adobe’s Premiere Pro and After Affects is huge if you aspire to take your editing to the next level. 2. How did you start doing videos? 3. What can you tell us about the computing gear you use for video editing? I use a standard off-the-shelf PC with an i7 CPU and 24 gigs of RAM. I can't afford a Mac. 4. What's your favorite camera to shoot with? 6. How much time do you usually spend filming for a 5 minute mountain bike video? And how much of the footage you use in your final clip? I spend somewhere in the neighborhood of 4-6 hours filming a trail project and usually capture about 2- 3 hours of footage. That means that over 99% of the footage ends up on the editing floor. 7. What do you like most - shooting or editing? I would have to say shooting. There's nothing like the feeling of capturing an awesome scene or event on film. 8. What's your favorite video gear accessory? That would be my slider and newly acquired jib crane. I love moving camera shots. 9. Where do you publish more often and why? I publish to both YouTube and Vimeo. However, I only publish to YouTube for the traffic exposure. For presentation or embedding I use Vimeo because there are no ads. 10. What's the number one quality aspect of a video? The qualities I strive for are focused stable shots and great audio quality. Have a question for Manny, drop a comment and let's chat. Stay tuned for the latest trail reviews on Vimeo and follow Manny on Twitter. Naturally, I like it! Looks very familiar, but in a professional way. Constantin, you're gonna have to come over here quick. From what I hear, this is the final year for the Dash for Cash race...At least as it's known. But if you can't make it here to help film, maybe I can get Manny to come West a couple miles to give a hand. :-) I guess Manny is your guy for this. I'm booked to carry Calin's gear. Whys is it the final year for the race? Look for new sponsors and keep it going. Ha ha. Well, the founder and property owner (one and the same guy)for the race has lost interest I guess. He's been doing it for 15 years. My brother and I are watching Manny's videos right now BTW. Good stuff. Must be a cash issue. We had some climbing competitions die for a year or two then they came back. But when there was no competition, we still went there just to climb (big crowd - not as big as when the competitions were held though). Maybe you can do the same - just meet and ride together for fun. I guess the owner would't mind.